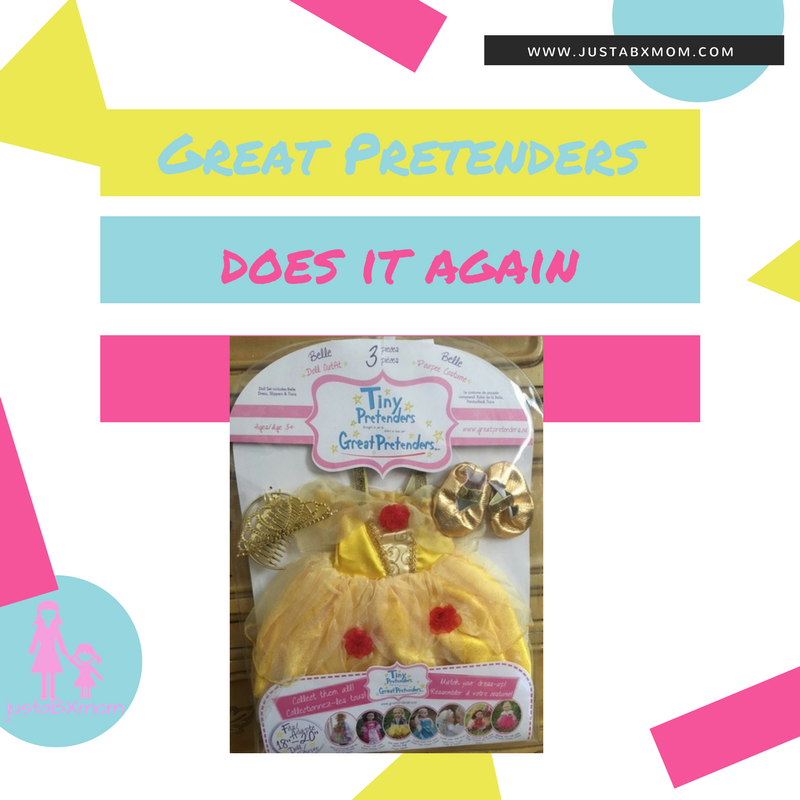 Baby Belle – Great Pretenders Does It Again! You know how excited JustaBXgirl was to be able to dress up like Belle from Beauty And The Beast? Imagine her delight when she received a matching dress for her baby doll from Great Pretenders? Yup, the squeal that could be heard city wide. This mama did her own happy dance because it mean now I didn’t have to attend EVERY tea party! Since receiving her Belle Doll Outfit all of JustaBXgirl’s baby dolls have been fighting to wear it. The reigning champion has been Flower. She was even able to accompany us to an advanced screening of Beauty And The Beast. JustaBXgirl seems as excited to be matching with her doll as she is when her and I wear matching looks. I personally love Ashlyn in the Belle dress but JustaBXgirl insists on Flower keeping it! And of course by now you know we’re huge fans of Great Pretenders costumes. The doll costume is no different. It will be used for a long time in our home. The quality is just as good as that of the children’s costumes. This set comes with a satin and organza dress, gold slippers and tiara and fits 18 – 20 inch dolls. JustaBXgirl has really been into her baby dolls lately so this is a perfect addition to our home. It was really precious to see my little Belle with her own little Belle when we went to see the movie this week. If you have a Belle and baby doll fan then I think you should check out the site. They do have other doll costumes available as well. And as always they are super affordable. This costume is listed on the site for $20. They also have the child Belle Costume available in case your little one still needs the costume as well. I adore how the dress works well on more than one type of doll. You can see above how the dolls have different body types yet the dress looks good on both of them. If only all dresses worked that way! I’ve never seen this brand. Glad to learn about it. My girls have recently started playing with My Life dolls. This is one of our favorite brands. Quality and cost are awesome.